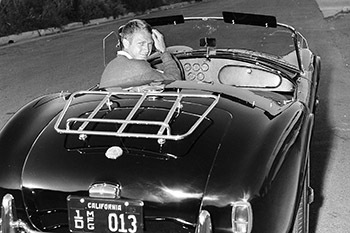 Steve McQueen was, is and shall remain the coolest. 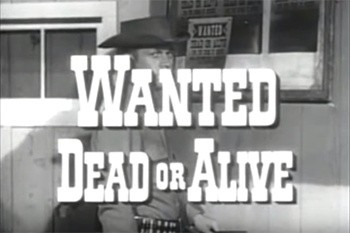 The foundation of his iconic cool was laid on the Western television show Wanted: Dead or Alive. 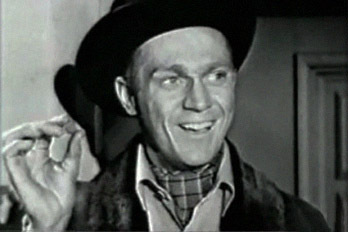 The series ran from 1958 to 1961 and made the actor a household name. With his trusty, nifty weapon and cowboy swagger, McQueen's bounty hunter Josh Randall made a great hard-boiled hero. DeForest Kelley and Mary Tyler Moore briefly appeared on the show, too, but we're focusing on its star. Here are a fistfull of things you might not know about Steve McQueen, Josh Randall and Wanted: Dead or Alive. Bounty hunter Josh Randall first appeared on another Western in 1958, the Robert Culp vehicle Trackdown. A Texas Ranger who patiently rolled his own cigarettes, Culp's character was a forerunner of the cool cowboy perfected by McQueen and Clint Eastwood. 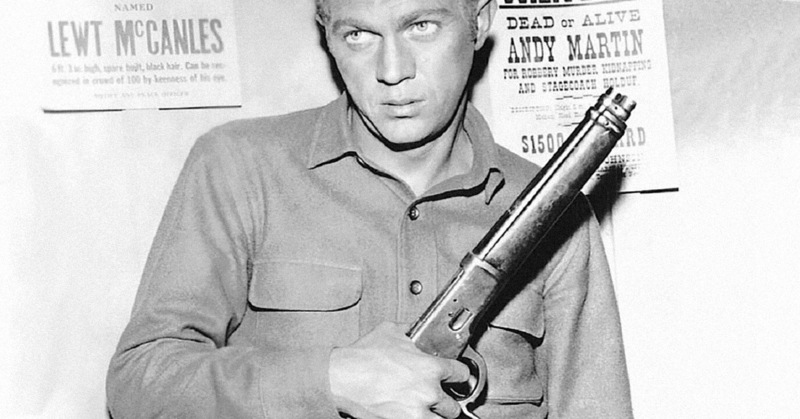 McQueen appeared again on Trackdown that same season playing dual roles, brothers Mal and Wes Cody. Image: Trackdown, "The Bounty Hunter"
Josh Randall's gun was implausible. Randall's "Mare's Leg," strapped to his right leg, was the envy of boys playing cowboy across the country. While it was an awesome weapon, it was completely unrealistic. For starters, as with The Rifleman's rifle, the gun was an anachronism, a cut-down Winchester Model 1892 in a setting pre-1892. 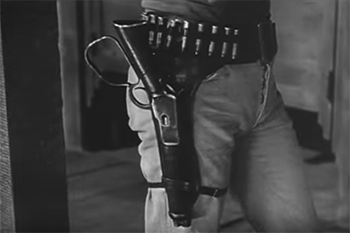 Additionally, the .45-70 rounds worn around McQueen's waist would not have fit the gun's smaller chamber, but were used as props because they were more visually impressive. Yet you can buy a working model of the Mare's Leg today for about a grand. 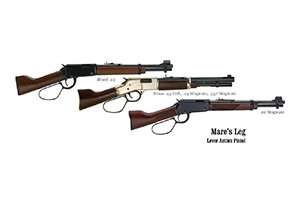 That being said, rifle manufacturer Henry currently sells three iterations of the Mare's Leg as a .44 for $975, inspired by the Western series. There were two different themes. The triumphant music heard in the first season (listen here) was replaced with the brassier, more martial theme heard here. The earlier version was composed by William Loose, while Herschel Burke Gilbert wrote the latter. At one point, bounty hunter Randall has to bring in Santa Claus. In "Eight Cent Reward," a young boy pays Randall eight pennies to find Santa Claus. The bounty hunter dresses up barfly Ben Hatch as the jolly fat man but things do not go so smoothly with the old sot. Steve McQueen allegedly faked a car crash to get out of the show. McQueen was itching to take his career to the big screen. When offered The Magnificent Seven, the actor could not get out of his commitment to Wanted. Unwillingly to pass up the role, not to mention being discontent with his TV gig, McQueen took a rented Cadillac and ran it into the Bank of Boston, according to Marc Eliot's biography Steve McQueen. He showed up with a neck brace (undoubtedly making it look cool) and forced a delay in production of the series, which allowed him to go shoot the film. McQueen danced a jig in celebration when production wrapped. McQueen, seen here eating on set with director Don McDougall, did not hide his glee when the series was canceled. Eliot writes that "Steve celebrated his last scene onset by doing a jig in front of everyone." When later asked about Wanted, McQueen would say that Randall had been killed by bad guys, closing the door on any potential revival. The German title of the show literally translates as "The Head-Money Hunter." Germans call the show Der Kopfgeldjäger, which means "The Bounty Hunter." But the literal translation is fun to say. 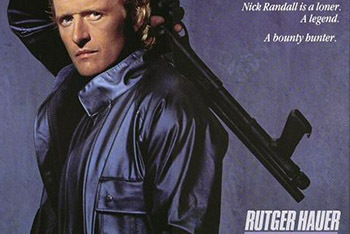 There was a movie sequel, of sorts, starring Rutger Hauer as Josh Randall's descendant, Nick Randall. If McQueen told folks that Josh Randall had died, that still left open the door for more stories following his fictional offspring. In 1987, New World Pictures released Wanted: Dead or Alive starring Rutger Hauer, both a reboot and de facto sequel to the original Western. Ex-CIA operative Nick Randall, perhaps the great-great-grandson of Josh, hunts terrorist Malak Al Rahim (played by KISS frontman Gene Simmons, naturally).